The past two weeks have seen a steady rise and leveling in the market causing the cost of hedging to return to end of 2013 levels. As of the Feb 21st the short-term daily cost was flat at 0.80 basis points per day and the mid-term cost out to September 2014 dropped to 0.97 basis points per day. There isn’t a whole lot to say about the past two weeks except that we’re back at low levels and we think it is a good time to hedge if you’re putting new money to work. Last week, we introduced the Retirement strategy and talked about finding a level where the cost of hedging was very affordable. That still exists and we think over the long-term using options to create synthetic exposure and limiting losses is a smart way to go. Especially considering the low cost to put on protection. If you didn’t get a chance to read it, take a look at the post from 2/21/14. There are plenty of bulls out there these days and a fair amount of flat-year pontificators. From our perspective, an up year is a good thing, but a sideways year isn’t going to cost you very much to create protection. After a year like 2014, fear of a pullback will always be in the forefront of all investor thoughts, but hedging is there to keep us disciplined. So follow rule #1 and Hedge Every Investment and you’ll sleep better at night knowing you’ve protected yourself and stayed true to a long term plan. We have been posting mostly about using collars to build a hedged portfolio for the last 3 years – just like our book recommends. But our book also talks about how to use ITM calls to build a hedged portfolio. Today, we want to introduce the Buy & Hedge Retirement portfolio that uses ITM calls. Using ITM calls as stock/ETF replacements makes a lot of sense – but because the calls eventually expire, it creates a tax consequence earlier than owning the ETF in a collar would create. This is where the RETIREMENT part of the strategy name comes in. We recommend this strategy for qualified accounts like IRAs and 401ks. You can have short term gains or regular turnover in the portfolio and not have any tax consequences. In our book, we talk about buying the call in-the-money – and you determine how far in the money based on the max loss you would be willing to incur. In this strategy we are launching today, we plan to buy right AT-THE-MONEY or just 1-2% in-the-money. Our rationale: the cost to hedge is still hovering near historic lows. Let’s look at an example: You can purchase ATM call on the SPY (S&P500 ETF) that expires in January 2015 for about $9.40 with the SPY trading at $184.75 (the ATM call is the $184 strike in this case). That has an extrinsic value of roughly $8.65 – or 5.1% annualized. At 5.1% annualized, that is reasonably low – but you wouldn’t look back on the year and think that paying 5% cost of protection was going to be an acceptable drag on your portfolio. But you are left with a lot of cash in your portfolio when you buy this ATM call. If that cash can be invested in a protected income device, you might be able to reduce that cost of hedging. Let’s explore. If you bought 10 contracts on the January 2015, it would cost $9,400. You are controlling an implied portfolio value of 1000 shares times the SPY price of $184.75 -> or $184,750 portfolio. We don’t recommend having a notional value greater than your portfolio value, so, we recommend this portfolio strategy for a portfolio of $185,000 at minimum. After buying the call, you would still have roughly $175,000 in cash remaining. If you can invest that in a fixed income ETF with around a 3% to 5% return, you could generate a lot of the return needed to pay that 5% cost of hedging. In the past, we have purchased the JNK (Hi Yield ETF) and collected around a 6-7% dividend – then we re-invested half of the dividend in to protective puts that were out of the money. We netted to a 3%+ return from that strategy – and the puts provided crisis protection in the event of a credit event in the markets. So, in effect, we transferred our risk from the equity markets (because we own ATM returns) to risk in the credit markets (the fixed income ETFs). This strategy worked very well through the last couple years as interest rates were on the decline and the ETF in JNK was increasing. But now we face a rising interest rate environment where the prices on fixed income are declining. The hedge we built on JNK before would not save you from the slow decline that accompanies a slowly rising interest rate environment. Which is why we are interested in the new product from ProShares – the HYHG. It owns similar investments in Hi Yield corporate bonds and then it shorts Treasuries. In effect, you are interest rate hedged – but not credit crisis hedged. You capture the spread between interest rates on Hi-yields and Treasuries - at a matching duration of around 4.5 years. The net interest after the cost of the treasury hedge is around 3.5%. What have you done here? You have traded equity risk for bond risk – but not normal bond risk. You are taking credit crisis risk – not really interest rate risk. So now, you are making 3.5% return on 95% of the portfolio. That leave you with around 1.5% cost of hedging. That is getting closer to what we can stomach – especially for ATM protection. But we can cut a chunk in to that also. We can sell an OTM call against the long call we bought at the money. We generally like to look at about a one standard deviation stock move in the underlying that is implied by the options pricing. In this case, that is selling the $210 strike in the January 2015 expiration to match your long call. You can sell that for about 85 cents – or exactly 0.5% annualized. In general, if we cannot get at least ¾ of 1% for our short call a full year away, we don’t take it. It’s not enough to entice us to give up the upside. So, we may settle on the 1.5% cost for hedging – but for AT-THE-MONEY protection, we like that set-up. Next week, we will write about some short put strategies you can use help close that 1.5% gap. Lastly, we have back-tested this strategy buying one year out in a 2-step ladder – meaning we were always buying on the June and December expirations. The chart of the returns back to December 2007 to December 2013 are included. The returns are attractive – especially given the protection it provided through the 2008-09 crisis. The primary benchmark is the S&P500 itself. If you went on a 5 day vacation last week and just got back you may think you didn’t miss anything interesting in the market. However we all know the exact opposite is true. As of the Jan 27th the short-term daily cost dropped to 0.76 basis points per day and the mid-term cost out to September 2014 was virtually unchanged at 1.10 basis points per day. A few interesting things have happened in the cost of hedging. The peak to trough to peak range of the S&P 500 was 2.5%. Monday saw the worst trading day since June 20th 2013 with a decline of 2.3%. This sent the VIX to close at the end of day high of 21.44, a level not seen since Dec 28th 2012. You may remember that day as the fiscal cliff deadline miss. It’s not surprising that we saw short-term costs of hedging spike above the long-term. This is known as backwardation. That means that short-term volatility is higher than long-term volatility. Historically speaking, short-term pops in volatility will create this backwardation and is why we watch for it in the cost of hedging. It also gives market timers a data point to use to detect reversals. In our historical data, you can see that this happened in October and June 2013, although both times it was too short lived to mean anything for the rest of the year. However, in May and June of 2012, it did mean markets were choppy enough to cause some level of fear. One difference being that the VIX was closer to 25 than the 21 we just experienced. Using backwardation as a guide of when to hedge and not can also be helpful. Hedging when the short-term cost is more than the long-term usually is more expensive than it has to be. In the last 2 years when there was some backwardation, a week or two later, the data reverted to normal within a week or so and hedging got cheaper again. For example, this time around on Monday the 3rd, the short term rate popped to 1.32 bps/day while the long-term was at 1.24 bps/day. Fast forward to now and both have declined to more affordable rates. Choosing when to hedge doesn’t have to be a mystery though. Just keep a disciplined habit of entering when there are no hedging red flags, like backwardation, and you’ll find that you’ve eliminated some of the complication. Think of hedging as something you do unless there is an issue. Compared to trying to time the hedges based on when you think a pullback is coming. If you do this, you’ll stay hedged most of the time and not worry if you’re putting too much drag on a portfolio. We wrote about some new products we like from ProShares that capture the interest spread between different classes of fixed income: Treasury to Hi Yield and Treasury to Investment Grade. However, no product exists that captures the spread between Hi Yield and Investment Grade Corporates in the ETF space. So, can we build it ourselves with options? The first thing you must be able to do is find a fixed income ETF in each category with a similar weighted average maturity and similar effective duration. These ETFs have to also have options. Ideally, these options will be robust and liquid. This was not an easy challenge. Our favorite investment grade and hi yield funds are the LQD and JNK - the iShares iBoxx $ Investment Grade Corporate Bond ETF and the SPDR® Barclays High Yield Bond ETF, respectively. But we have a mis-match between the duration and weighted average maturity dates of the fixed income inside the funds. LQD has a 7.5 effective duration and an 11.5 weighted average maturity. JNK has a 4.3 and a 6.7, respectively, in the same measures. In other words, LQD is much more sensitive to interest rate moves than JNK will be because it is further out on the curve. Our problem: there are not any really good investment grade corporate fixed income ETFs with robust options markets except the LQD. So, LQD has to be our hedge option as we want to be bearish the investment grade corporates with a small amount of capital – and the put market that exists on LQD should permit that. Our mission now: what Hi Yield ETF do we use? I think we have two options: (1) we either use options on JNK and acknowledge the mismatch in duration OR (2) we purchase an ETF in the Hi Yield category with a better duration match to the LQD. Believe it or not, there really are no meaningful high yield ETFs with a maturity or duration that are materially longer than the JNK. So, if we are going to do this trade, it will have to be option 1. We’ll discuss the risk of the duration mis-match later. So, if you had a $100,000 portfolio that you wanted to use for this trade and you wanted to be equal dollar bearish and bullish using options, you would need to find how many shares of each ETF are needed to equal $100,000. For JNK, priced at $40.70, that is 2400 shares. For LQD, priced at $116.08, that is roughly 900 shares. These would be $98k and $105k, respectively. You want these amounts to be a close match. So, take the JNK up to 2600 shares. That means each options transaction will be 26 contracts for JNK and 9 contracts for LQD. The trade is simple: you purchase 9 contracts of deep ITM puts for LQD and you sell 26 contracts for deep ITM put for JNK. You will notice that these deep ITM puts have a fair amount of time value. That time value is actually the discounted value of the dividends between now and the expiration of the option. Both have options thru at least September of this year – so I recommend using the Septembers. I also recommend that you go deep enough in the money on the LQD put that the time value becomes the lowest it can be – to reduce your ‘short interest’ that you pay being bearish the LQD. I then recommend that you make the JNK similarly deep ITM in size (ie, % ITM). An example today would be: purchase the September $120 puts on LQD for around $7.20 and sell short the September $43 puts on JNK for around $4.10. If you do this in a margin account, the total buying power used will be less than $30,000 – but you will have effectively created this spread trade for a $100k portfolio. When you collect the premiums for JNK, you are collecting ~$4700 in time value (ie, discounted dividends) and for LQD, you are paying ~ $3000 in time value. So, you net $1700 in discounted dividends on a $100,000 position for a 7 month expected hold time. That will be roughly a 3% annualized return – effectively the annual spread between these 2 products. So what are our risks? Fixed income has interest rate risk and credit risk. Let’s discuss the interest rate risk since the mis-match comes in to play here. If interest rates move up, the price of both bonds will go down. But the LQD should go down more in value because it is further out on the duration curve. If rates go down, then LQD will increase in price more than JNK on a relative basis – for the inverse reason of rates going up. The LQD is just more sensitive to interest rate moves. The net/net on interest rates: if you think rates are headed higher because the Fed is going to push them higher, then you should like this trade. The other risk is the credit risk. Is the credit risk in this example hedged in any way? Not if you are just bullish Investment Grade and bearish on High Yield. Look at the credit crisis from 2008/09 in the chart below. You can see that at their worst, these two deviated in price during the early 2009 market plung by 30%. That woule show up in the price of this trade also. 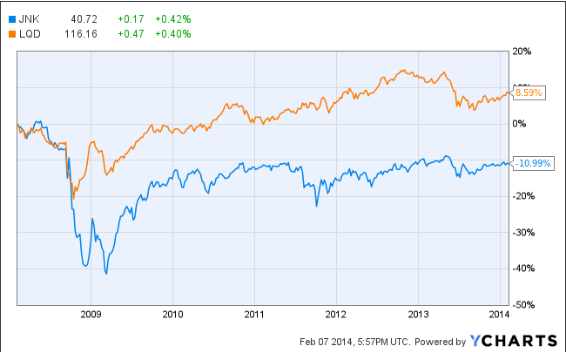 The price performance in these two funds deviated significantly in 2009. So, if you make this trade, you must believe that there is no credit crisis looming. Remember that a credit crisis will always hurt the junk bond category worse than it will hurt the investment grade category. If you are really worried about the credit crisis event, you could purchase a deep OTM put on JNK between $30 to $35 strike price. This should cost you less than 25 cents or roughly 1% of the annual spread. But that might give you the comfortable feeling of knowing you have a floor in the event of another 2008 credit event. Overall, this trade isn’t perfect – but as long as we avoid a credit crisis, this trade should clip a reliable 3% annual return with fairly low volatility. In addition, the trade is poised to make additional returns from any increase in interest rates!